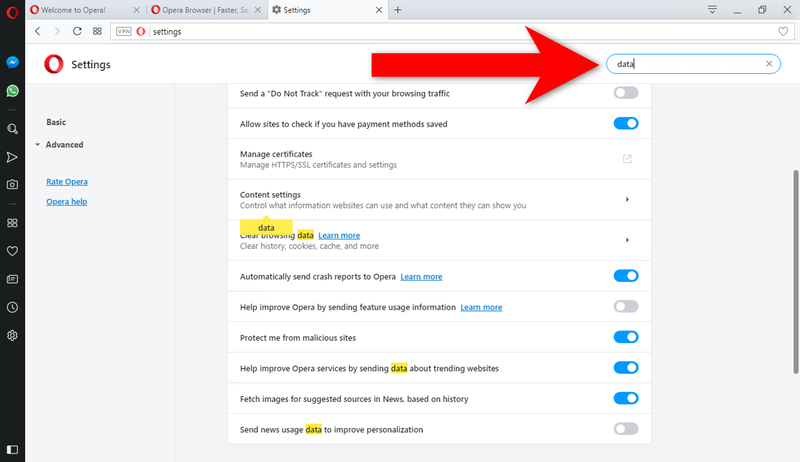 There are four ways to open Opera’s settings page: through the Opera menu, the sidebar, Easy Setup, or a keyboard shortcut. The Opera menu has shortcuts to other pages and features in the Opera browser. You will find Opera’s settings page in the Opera menu. To open the Opera menu on Windows or Linux, click the button in the top-left corner of the Opera browser. At the bottom of the menu, you will find a link to Settings. To open the Opera menu on Mac, click Opera in the toolbar. Here, the settings page is under the name Preferences. You can open Opera’s settings page from the sidebar. Go to Opera’s start page. Right-click or Ctrl + click on the sidebar. In the pop-up menu, click Settings. The settings icon is now added to your sidebar. Click the icon to go to Opera’s settings page. You can pin the sidebar to Opera so that it is accessible while browsing on any web page. To pin the sidebar, click the switch found at the bottom of the sidebar. Click the Easy Setup button in the right side of the toolbar. Then, scroll down and click Go to browser settings. Some of Opera’s most popular features and settings can be adjusted in Easy Setup. It is a great way for new users to become familiar with the Opera browser, or for experienced users to make quick adjustments. At anytime while browsing on Opera, you can open the settings page with a keyboard shortcut. On Windows or Linux, press Alt + P.
On Mac, press ⌘ + ,. These and other shortcuts can be customized. Click here to review keyboard shortcuts in Opera. The settings page in Opera has a search bar to help you find a particular browser setting. As you type in the search bar, the settings page will show results matching the keywords you have entered. Matching results will be highlighted in the settings page.